If there's one time you really want to be organized, it's when you're traveling. These tips for creating itineraries, packing carry-ons, and organizing your travel mementos will help make sure your trip goes smoothly. Cut the stress by taking a few simple steps to plan ahead. 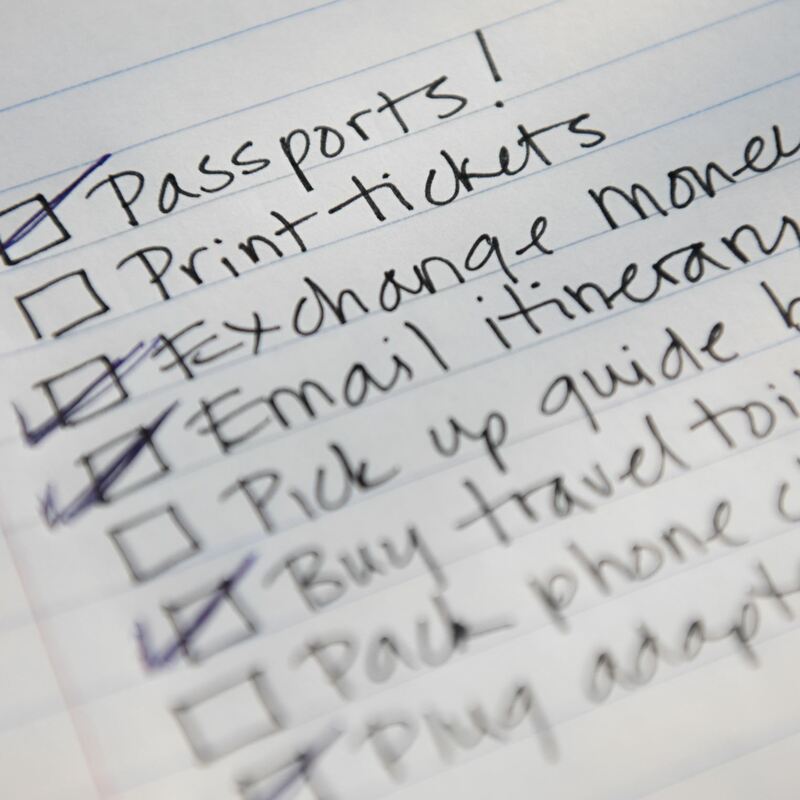 A travel planning checklist allows you to relax. Use one for big or small journeys, as they can be flexible no matter if you're planning really far ahead or spur-of-the-moment. Whether you are planning a trip six months out or two days ahead, you can use this to check off what you need to get done ahead of time. Part of a road trip's appeal is the idea of just jumping in your car and going, but we all know leaving home without your travel essentials like money, maps, and emergency beef jerky is a bad idea. Make a list ahead of time so that you don't forget anything that will make the ride more comfortable. My friend Tom writes the times and numbers of his flights and hotels on an index card he keeps in the breast pocket of his blazer. Some people like to keep travel docs in a clear plastic folder. There's no great mystery here: Having all of this information written down will save you from wondering where you're supposed to be and how you're getting there, even if your phone runs out of battery. Make a list before you begin, even just a general outline of what you'll need. 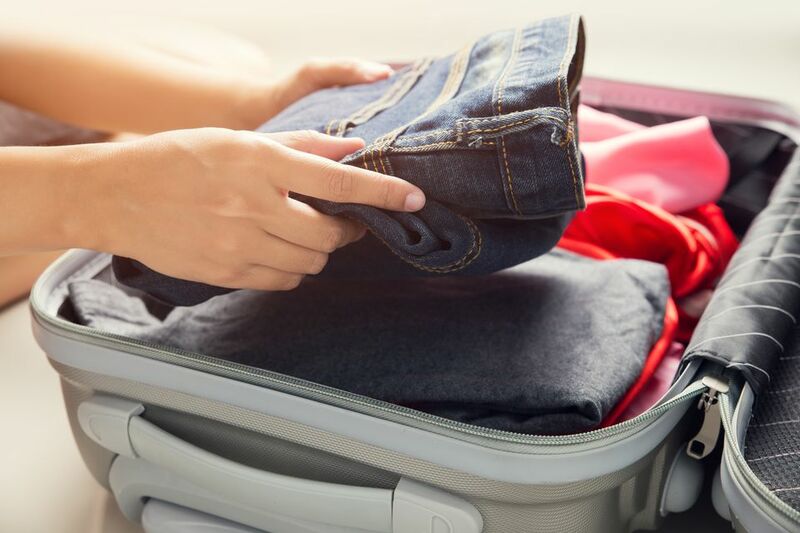 Roll up your clothes to fit more into your suitcase. Bring extra plastic bags and be amazed at how often they come in handy (think: leaky shampoo bottles, snacks, wet clothes, laundry). When in doubt, choose a rolling suitcase over a shoulder bag to save yourself from back pain. Pare down on heavy shoes and choose only a few pairs that can multitask. Always pack clothing that can be layered between indoor and outdoor venues. Bring clothes in complementary colors that can be used in a variety of outfits. Nothing says ease like a rolling suitcase. To avoid spending valuable time at baggage claim, think about bringing one carry-on and then a personal item like a handbag or backpack for the items you'll use in-flight. Bring a small journal on the road as a catch all. Travel journals aren't just for writing; they are a great way to capture, store and display those little mementos and keepsakes you collect on a trip that may be just as meaningful as your gift shop purchases. Think: address cards, matchbooks, receipts from memorable meals, museum tickets, and more. You can also jot down notes you'd like to remember. You should always allow plenty of time before your flight, but before you go to the airport, decide which route you're going to go if you're picked for a screening. Be considerate of people behind you in the security line that could be stalled while you choose between body scan and pat down. Do your research and decide ahead of arriving at the airport. File this in the "This will never happen to me, whoops now it just did" folder. Chances are you are not going to have any issues on your trip but just in case, make sure a responsible adult whom you trust knows your general whereabouts. Unless you know everyone on your friends list very well, it's not a good idea to have your whereabouts posted online anywhere. Chances are you've accepted a friend request from a former work colleague or someone you met briefly at a party. It's best to keep the details of your trip private until you've returned. Just like kids, adults can get cranky traveling. Make sure you pack yourself snacks, drinks and something you enjoy–books, magazines, sudoku or crossword puzzles, knitting, music, audiobooks, DVDs, playing cards, brain teasers, a travel guide of your destination–something to keep you occupied on your journey. Traveling should be an adventure; think about the time as a break from work, tasks, and email to indulge in some hobbies you love. If you're off for the holidays and plan to travel, think about some of the home organization tasks you can accomplish while you're out of town. Before you leave, drop your shoes off at the cobbler to have them weather-proofed, re-soled, or polished. Drop your knives off to be sharpened. They should be sharpened by a pro twice a year. Have your window treatments professionally cleaned. If you're worried about people being able to see into your home while you're away, stick to the treatments hanging in the top floors only. Drop off any heavy use items at the dry cleaner for a good cleaning, like a winter coat you're not bringing on your trip or your comforter. After you've been away, there's nothing worse than unpacking. First you have to separate your clothes, then wash, dry, re-fold, and finally, put away everything. It's a process, but that still-packed suitcase in the corner will haunt you as long as you don't tackle it. Do this as soon as you arrive home from your travels. Even if you're tired, think about how the action of unpacking will make you feel immediately, 10 minutes from now, and then the next day. It's a little effort now to feel better later. Do it as soon as possible!